China intends to cut coal consumption by 160 million tons by 2020, and up its use of non-fossil energy to 15 percent by then. Air pollution has been linked to a spike in lung cancer in Beijing and a reduced life expectancy in some regions of 5.5 years. China will reduce its coal consumption and move towards cleaner energy such as hydropower, nuclear, wind and solar, according to a 2015-2020 action plan, released by the Ministry of Industry and Information Technology (MIIT) and the Finance Ministry on Friday, Xinhua news agency reports. The country’s coal consumption fell 2.9 percent last year for the first time in 14 years as China is trying to diminish air pollution and to boost green energy output. The country's current coal consumption accounts for about 66 percent of primary energy use, 35 percentage points higher than the world average. Only 8 of 74 China's major cities met the country's air quality standards in 2014, severe air pollution plagued not only northern China, the coal-mining region, but also coastal cities in the south, such as Shanghai. Last year China declared a "war against pollution", calling for tougher regulations over polluting industries and suggesting long-term planning with a focus on the promotion of green techniques. Since then the country has banned 7 million high-emission vehicles from the road, shut down 50,000 coal-fired furnaces, installed filtration equipment in power plants and factories, and added new sewage treatment plants. "We will strive for zero-growth in the consumption of coal in key areas of the country,"Premier Li Keqiang said in the report delivered to parliament on Thursday. "Environmental pollution is a blight on people's quality of life and a trouble that weighs on their hearts," Li added. China set a goal of reducing its energy intensity by more than 3.1 percent for 2015, the Chinese Premier announced at the National People’s Congress on Thursday. Energy intensity is the amount of energy a country needs to increase its GDP, higher levels indicate a higher cost of converting energy into GDP. Last year the country exceeded its 3.9 percent target for cutting its energy intensity, hitting 4.8 percent. An online documentary on China pollution, which was published by a famous Chinese journalist earlier this week, has become a viral sensation, with more than 300 million views. A 103-minute film details a yearlong investigation into the main causes of China's air pollution. China’s two most powerful state-owned oil companies Sinopec and CNPC are as well criticized by the journalist for resisting tougher fuel standards. Improving efficiency and environmental standards for coal would be a key component of China's energy policy for 2015, according to leading Chinese energy official Nur Bekri. "For areas affected by severe smog, regions where conserving energy is difficult, and industries with overcapacity, we will strictly control the number of energy-intensive projects and implement policies for reducing coal use, and for replacing coal with alternative energy sources," the Commission’s report says. China is planning to raise natural gas output, and wind and solar power capacity in its move to boost the proportion of cleaner fuels. The country aims to bring its share of non-fossil energy to 15 percent by 2020 and 20 percent by 2030. 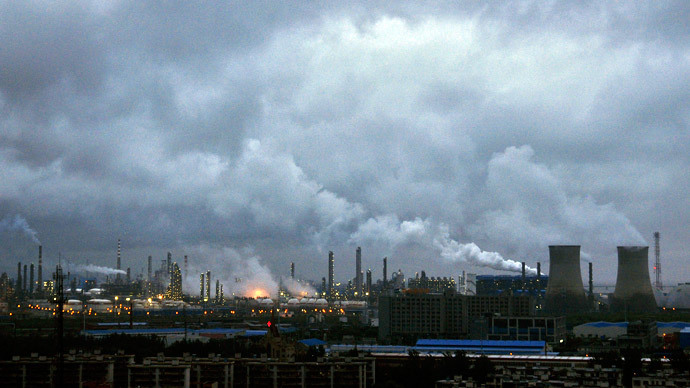 For decades China has been facing a huge pollution crisis, with major cities shrouded in constant smog and half the groundwater contaminated. Last year’s study by green group the Natural Resources Defense Council reveled that pollution from the coal industry alone killed 670,000 people in China in 2012.